2. Should you do a PhD? 7. Economics is not about money. 8. How falling house prices could end up making us rich. 10. I sat through a timeshare sales pitch on my holiday. Worth it? Cloudude on Gun advocates: say what you mean, and mean what you say. How much coverage will we gain from the planned Fisherman’s Bend rail station? The Victorian Budget, released today, sees the government replacing the planned metro rail tunnel with a “Rail Link” that will stop at Fisherman’s Bend. The point of the Melbourne Metro rail tunnel was to take pressure off the loop and better serve the city. This does not do such a good job of that, but it does serve Fisherman’s bend. Is that worth it? Let’s look at a map. The map below shows the redevelopment area, with the station in the middle of the Montague section of the Fisherman’s Bend redevelopment. The four yellow areas are the four sections of Fisherman’s Bend. As you’ll see below, the new station is not quite as useful as you might hope for a suburb that will supposedly be home to 80,000 residents by 2050. 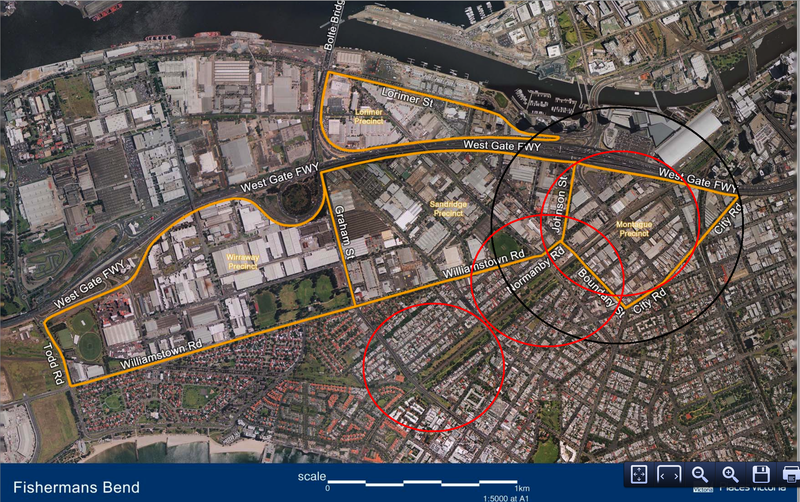 I have followed planning protocol and put an 800 metre pedestrian catchment around the train station (black circle) and a 400 metre pedestrian catchment around the stops of the existing 109 tram (red circles). It seems obvious that a train station is most useful near the centre of a population cluster. But putting the train station on a link between South Yarra and Southern Cross Stations means it has to be at the eastern end of Fisherman’s Bend (or do a very sharp turn of the kind trains can’t ). That eastern end already has good tram and pedestrian access. Civilised folk ought steer clear of the forums at railpage.com.au. That’s why bloggers get paid, to do that sort of work for you. Digging through those forums, the idea came up that Fisherman’s Bend does deserve a rail link. But it ought not be on this train line. Such a solution would permit the Fisherman’s Bend station to be nearer the middle of the suburb, and further from the area well-served by the tram. The rail link would then cross the river, linking fishermen’s bend to the west. For a government that goes on and on about the need for another river crossing, this could be a tempting proposition. Thoughts? Objections? Leave a comment below! Posted on May 6, 2014 Tags fisherman's bend, infill, melbourne metro, melbourne trains, rail link, transit-oriented developmentLeave a comment on How much coverage will we gain from the planned Fisherman’s Bend rail station?